First images from Palmyra – a UNESCO heritage site and archaeological gem that attracted tens of thousands every year before falling to ISIS. 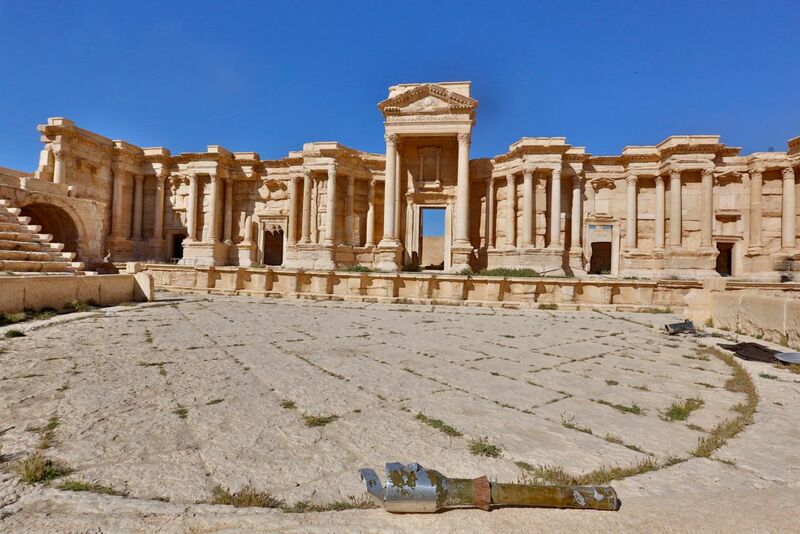 AP - Explosions rocked the ancient town of Palmyra on Friday and on the horizon, black smoke wafted behind its majestic Roman ruins, as Syrian army experts carefully detonated hundreds of mines they say were planted by Islamic State militants before they fled the town. 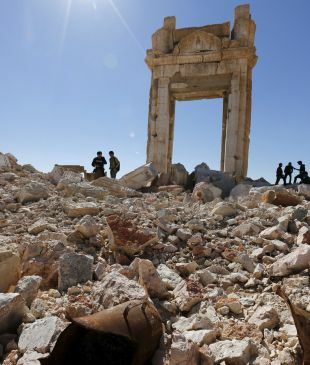 An Associated Press crew visiting the town Friday witnessed firsthand the destruction inflicted by the extremist group on the town's famed archaeological site, less than a mile away from the modern-day town of the same name, now completely deserted. While some parts of the site, including the Roman-era grand colonnades and amphitheater appeared relatively untouched, the damage was very much visible elsewhere. The remarkable Arch of Triumph, built under the Roman emperor Septimius Severus between A.D. 193 and A.D. 211, has been reduced to a pile of stones, blown up by IS extremists who filmed the destruction for the world to see. The monumental arch once sat atop the famed colonnaded streets of the ancient town. The Temple of Baalshamin and parts of the Temple of Bel, one of the best-preserved Roman-era sites, are also destroyed. Apart from the Roman ruins themselves, heavy damage could be seen on parts of the walls of Palmyra's towering Mamluk-era citadel, built during the Islamic conquest in the 13th century. On top of the scarred citadel, a Syrian flag flies in the wind. 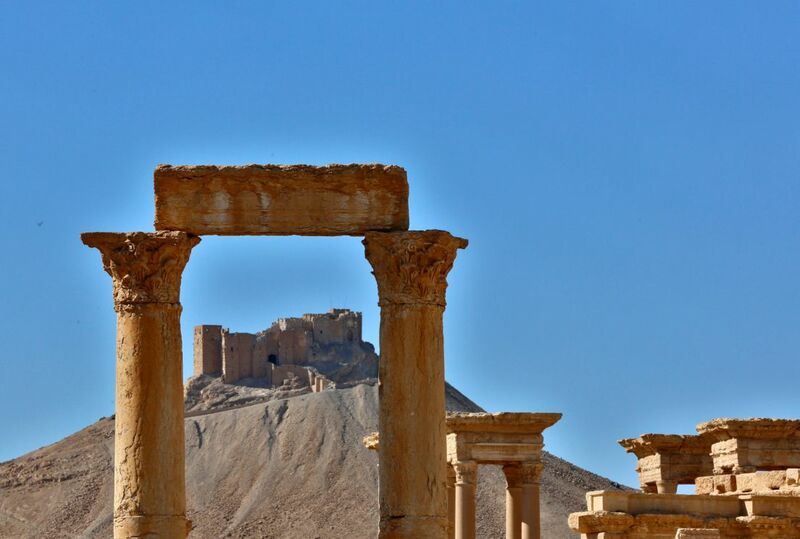 Palmyra is located about 248 kilometers (155 miles) east of Damascus, the Syrian capital. 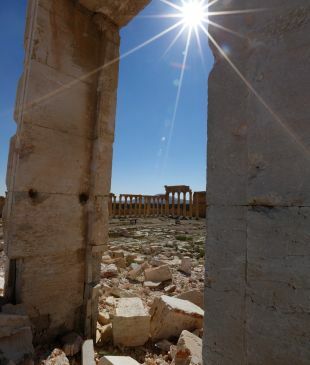 Government troops, backed by allied militiamen and Russian airstrikes retook the town on Sunday from IS militants who had controlled Palmyra and its environs for 10 months. Ancient Palmyra is a UNESCO heritage site — an archaeological gem that attracted tens of thousands of tourists every year. It was completely deserted on Friday, except for Syrian army soldiers working on dismantling explosives and visiting journalists. 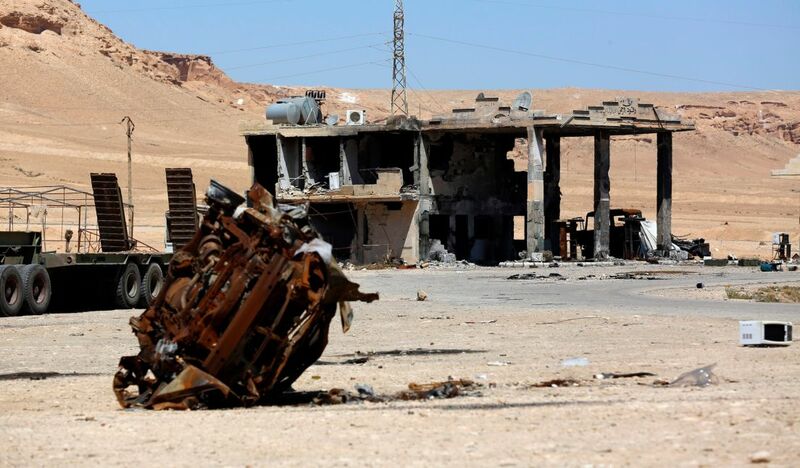 The town — about a kilometer away from the ruins — is completely deserted, its remaining residents had fled as the Syrian army's offensive against ISIS began a month ago. Traces of the fighting could be seen all around. Burned cars parked on the side of the road, electricity cables strewn about on the streets, and scattered empty water tanks apparently used as barricades. At the entrance to the Roman amphitheater, where ISIS filmed children shooting captive Syrian soldiers in the head, black graffiti is sprayed on a stone wall. "Lasting and Expanding," it read in Arabic, a logo of the Islamic State group. 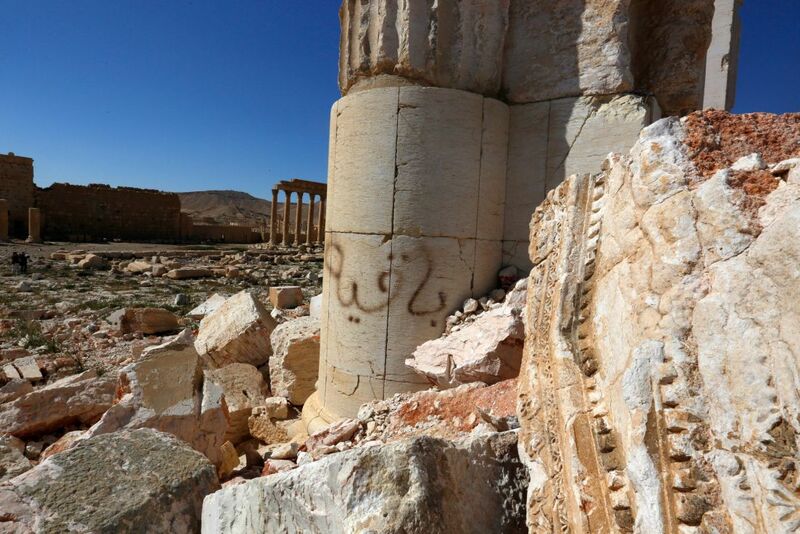 "The Islamic State" is scribbled on another nearby wall. A Syrian officer told reporters that more than 3,000 mines have so far been dismantled. "They booby-trapped everything, trees, doors, animals," he said, speaking of the militants. Russian sappers have arrived in Syria to help the Syrian army clear mines in and around the town. Later Friday, Syria's state-run SANA news agency reported that Syrian engineering teams and popular defense groups uncovered a mass grave in a northeastern neighborhood of Palmyra containing the remains of about 40 people, 23 of them women and children. The report, which could not be independently verified, said the people were killed by ISIS extremists. It said some bodies were beheaded, others bore signs of torture. 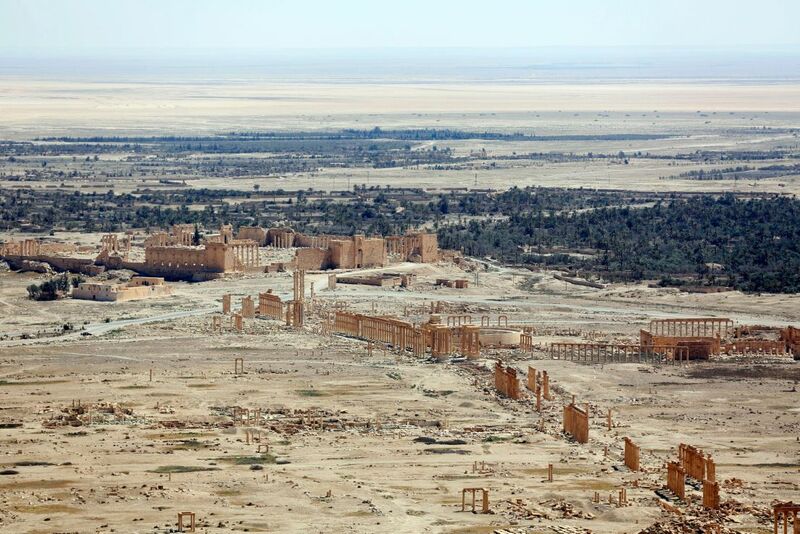 The recapture of Palmyra was a strategic coup for President Bashar Assad through which he hopes to convince the West that the Syrian army is a credible partner in combatting terror as it ramps up the fight against the Islamic State. "The Syrian army is defending Rome and London in as much as it is defending Damascus," another officer told the visiting reporters Friday. Both officers spoke on condition of anonymity because they were not authorized to give statements to media crews. He handed reporters a booklet he said the militants had apparently distributed to Palmyra residents. It reads: "Loyalty to Islam, not to the nation."